Studies in Ice, Studies in Ice Dress, and Skaftafell will all be 15% off through August 24th, 2017 midnight EST. No coupon needed! 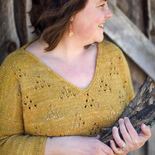 Join us for the Lopapeysa Knit Along! Knit any Lopapesya, or Lopapesya inspired sweater to join - find KAL details at www.threadandladle.com or in the Thread & Ladle Ravelry Group. 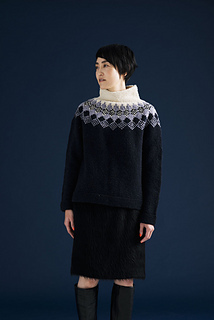 A modern take of the Lopi pullover, the traditional round yoke pullover of Iceland, this pattern was named after a national park in Iceland. The colorwork may seem complicated, but it uses only 3 colors and is very simple. Choose different colors to completely change the mood. Knit in Quarry, the pullover is light and well-shaped. Enjoy knitting colorwork while daydreaming of a trip to Iceland. (MC) Approximately 900 (1000, 1130, 1260, 1420, 1580) yards, 825 (915, 1035, 1155, 1300, 1445) m.
(CC1) Approximately 180 (200, 230, 250, 280, 320) yards, 165 (185, 215, 230, 260, 295) m.
(CC2) Approximately 180 (200, 230, 250, 280, 320) yards, 165 (185, 215, 230, 260, 295) m.
Sample shown in Lazulite 5 (5, 6, 7, 8, 8) skeins, Geode 1 (1, 2, 2, 2, 2) skeins and Gypsum 1 (1, 2, 2, 2, 2) skeins. 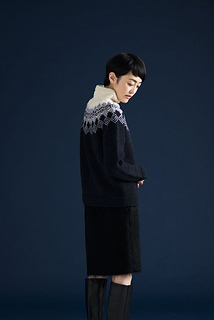 Sweater is knit from the bottom up in the round, and body and sleeves joined at the underarm. A few raglan- style decreases are made before beginning the circular yoke color work, which incorporates more decreases. Short rows are worked at before the turtleneck for a better fit around the neckline. Change to shorter circular needle or using magic loop method to work on neckline. 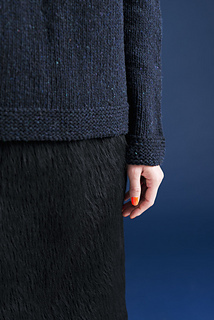 The sleeves can be knitted using the magic loop method, or using DPN.